Internal seed cage holds peanut hearts and sunflower seeds. 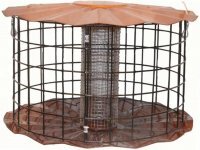 Features stainless steel cage, drainage holes and it's surrounded by sturdy 16 gauge vinyl coated wire mesh lobster trap material with 1-1/2" openings. Keeps out starlings and squirrels. Top and bottom are powder coated in Erva's exclusive Copper Tint finish. 14" Wide, 8" High. The distance from perimiter guard to edge if internal seed cage is 4-1/2"